Ruthenium is a chemical element wi seembol Ru an atomic nummer 44. 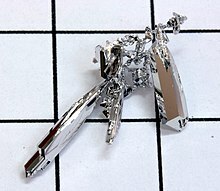 It is a rare transeetion metal belangin the platinum group o the periodic table. Lik the ither metals o the platinum group, ruthenium is inert tae maist ither chemicals. The Baltic German scientist Karl Ernst Claus diskivered the element in 1844, an named it efter Ruthenia, the Laitin wird for Rus'. Ruthenium uisually occurs as a minor component o platinum ores; annual production is aboot 20 tonne. Maist ruthenium produced is uised for wear-resistant electrical contacts an the production o thick-film resistors. A minor application o ruthenium is its uise in some platinum alloys. This page wis last eeditit on 17 Februar 2016, at 18:49.